If you were to put together a “bucket list” of all the things you wanted to do involving the game of golf what would you put on it? Hearing the roars of Augusta National on Sunday? Planning trip to Scotland for a chance to play some true links golf? Maybe getting a chance to meet one of your favorite players? 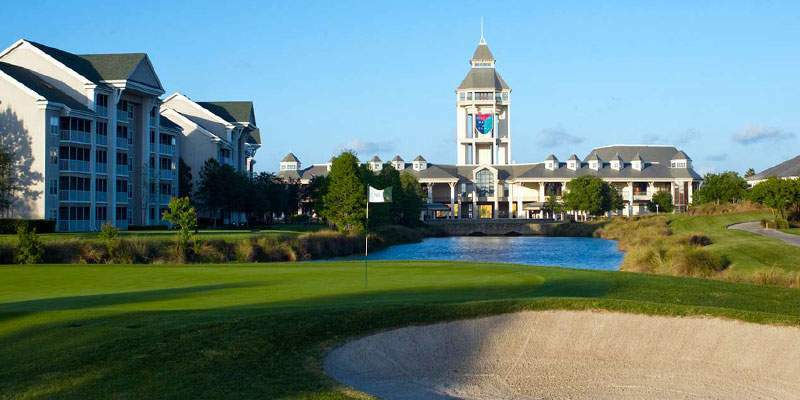 We’re all likely to have a different list, but a trip to the World Golf Village in St. Augustine, Florida, has got to be on there. Between the World Golf Hall of Fame, Renaissance Resort, and the two award-winning golf courses, the World Golf Village has everything you could possibly need for a great golf vacation. Here we’ll take a closer look at the only golf course to ever be co-designed by two of the greatest legends in golf, Arnold Palmer and Jack Nicholas. In what proves to be an exciting and challenging course for the lower handicapped golfers, The King & Bear is also a fun course for those who are looking for an enjoyable day on the links. Playing 7,279 yards from the Stone tees, the course certainly has some length to it, and with a 74.3 rating, it is challenging as well. A barrel of chilled apples and a beautiful opening hole are what await you for your tee time. The par-4 1st gives you a great feel for what the rest the round will have in store for you. A fairway that is wider than it initially appears is lined by a water hazard running up to a green guarded by bunkers on the left and right. Once on the green you’ll find that the speed of the greens adds another layer of defense to the course. Another common defense for the course is lateral water hazards running up to many of the greens. For example, the 546 par-5 fifth might at first seem reachable if you can make it over the large bunker right at the elbow of the dogleg; however with the hole guarded by a water hazard running up the front and down the right side of the green, your second shot better miss in the right place. Then you’ve got the long par-4 ninth. Playing as the hardest hole on the course, you not only need an accurate and long tee shot, but an approach shot that steers clear of the water hazard that runs all the way down the right side of the hole. You’ll also see this similar type of defense on both the twelfth and fifteenth holes on the back nine. In all, Palmer and Nicholas have done a superb job in designing The King & Bear. The course is undoubtedly a challenge for players of any skill set. Each hole on the course seems to offer a different set of difficulties, be it length, well placed bunkers, or well guarded greens, you need to have all of the clubs in your bag working if you truly want to be able to attack this golf course. So if you’re trying to put together your ideal golf bucket list, make sure you include a trip to the World Golf Village. You’ll get the opportunity to tee it up on this great course, as well as its counterpart The Slammer & Squire (more to come on that), not to mention the great customer service you receive anywhere you go in the park.